Precious Life is co-ordinating the organising of buses to the Rally from across Northern Ireland. This summer, the most important date on the pro-life calendar is 6th July. That’s when we hope you join with thousands of others to speak up for the right to life. Meet us at the Garden of Remembrance in Dublin City Centre on 6th July at 2pm! Ireland – north and south – is one of the last remaining places in Europe where abortion is still illegal. But our unborn children are under threat. Powerful pro-abortion campaigners in Ireland, the UK, European Union and United Nations are attacking our pro-life laws. In the South we are on the brink of abortion legislation that would open the doors to abortion on demand. Show the government you care about mothers and babies! On 6th July 2013, be there! Parnell Square North is in Dublin City Centre at the Northern end of O’Connell Street, the capital’s main street. 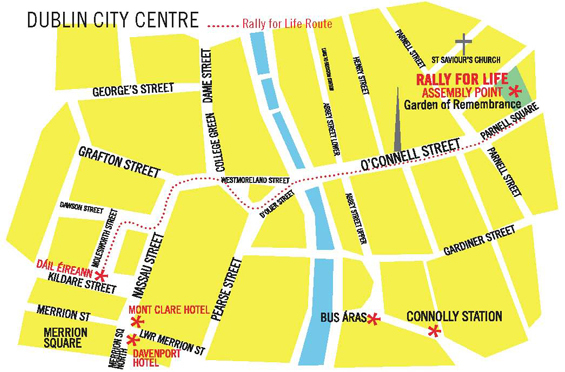 Most busses travelling to the city centre will stop at, near or on O’Connell Street. If you are driving, there are carparks at the Rotunda Hospital, the Ilac Shopping Centre, Marlborough St Car Park and Arnotts Car Park.